We are in a 2000 Komfort fifth wheel and our water heater quit working today out of the blue. The breaker was flipped and we flipped it back but the hot water is still not working. We noticed that the circuit board (35-525900-113) looks possibly fried. We've only used it on electric, not on gas. A few of the diodes also are loose or falling off. Is the circuit board only for when your on gas? Is there somewhere we can buy another circuit board? Is there anything else we can try before going out and buying a new water heater? We are in our fifth wheel full time so it's super important for us to fix this ASAP. Make and model of water heater? Breaker is for 120 volt option if equipped. Needs 12 volts DC on most to operate. Quick search shows you have a Suburban. Circuit board is easily available from Dinosaur electronics via Amazon. Suburban Water Heaters use 'separate' systems for electric and propane. 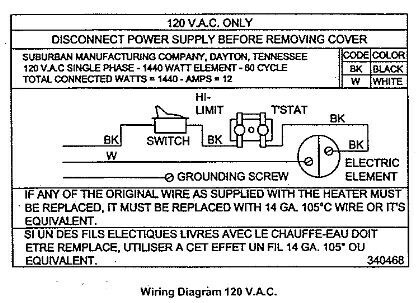 120V AC Circuit Breaker tripping...element most likely shorted/burnt out. I second the Dinosaurelectroics link.. But for my furnace I went with Dino boards.. I'm a trained electronics tech and the first thing I noticed was the QUALITY of the board.. (Way better than OEM) the next was. Well as an electronic Tech I have a theory as to what killed the OEM board.. Turns out Dino shares that theory because they put a protective device on the board to prevent it from happening again.